A warm spring morning and a bluebird sky lured me outside. Camera in hand, I wandered the neighborhoods of Duluth, admiring the frilly clusters of blossoms on the silver maple trees. I stopped under one tree that seemed to have all male flowers. Tiny bouquets of eager stamens erupted out of the red base of each blossom. The delicate stalks of the filaments lived up to their botanical term—looking as fine and translucent as monofilament fishing line. Anthers tipped the filaments with lures of mauve-colored pollen. Trees that bloom in early spring before the leaves unfurl, and before it’s warm enough for most pollinating insects to be active, are generally wind pollinated. The bee I spotted buzzing from twig to twig didn’t agree, though. Zooming in on my photos later, I confirmed that it was a European honey bee. I hadn’t noticed a hive in anyone’s backyard, but since this neighborhood contains quite an assortment of chicken coops, someone’s probably raising bees as well. All flowering plants have pollen. They have to: pollen is the source of the male gamete of a plant that fertilizes the ovule. This means that even wind-pollinated plants can provide food for bees in early spring. But pollen only comes from male flowers, or from flowers that have both male and female parts. 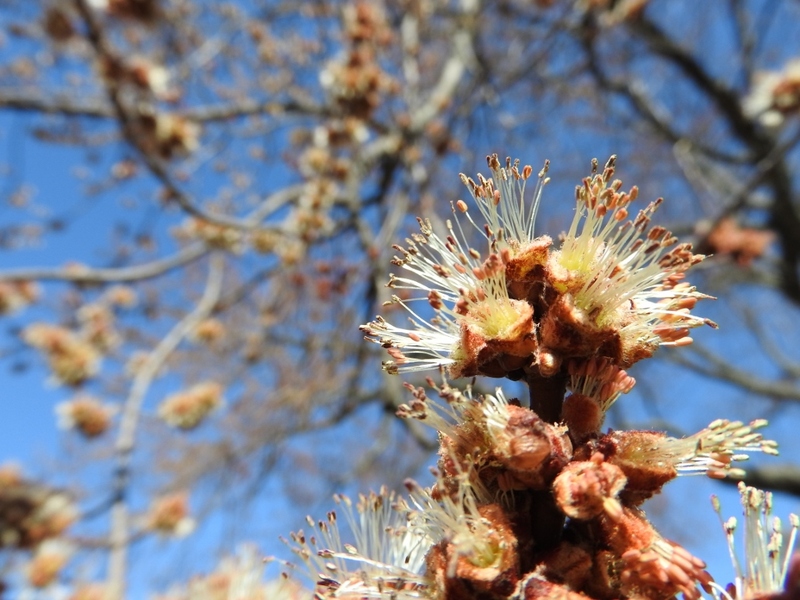 The female flowers of silver maple are on separate branches or even separate trees from the pollen-male flowers. If they want a bee to bring them pollen, they must offer nectar as a reward. 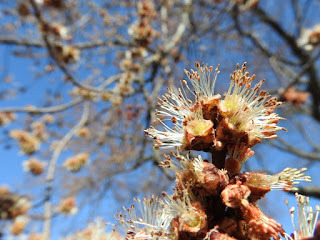 I’d recently read that silver maple flowers don’t provide nectar. But online beekeepers’ forums tout silver maple as a source for abundant pollen as well as some nectar, while lamenting the years when it’s too cold for their bees to take advantage of these resources. Silver maple seems to have a great system. In cold weather, when pollinators aren’t active, wind may do a decent job of transferring its pollen. When things warm up, though, silver maple can take advantage of the services of bees. 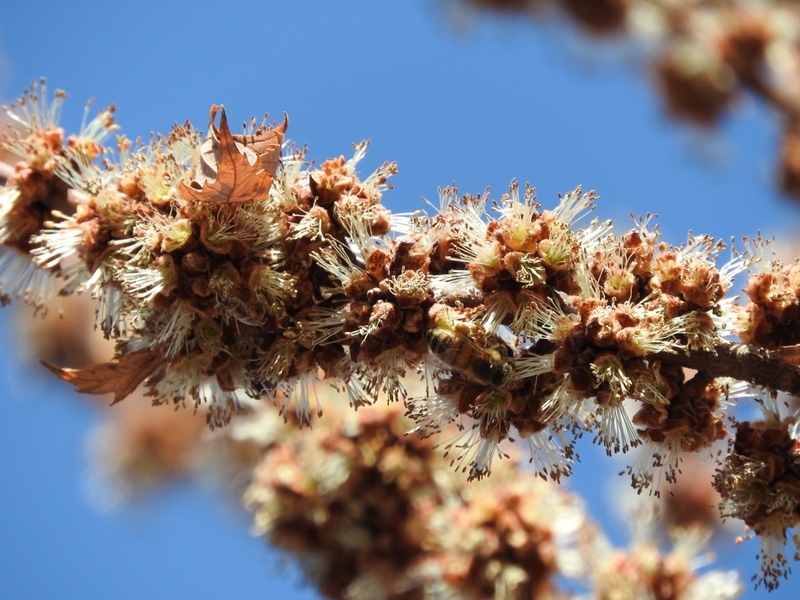 Silver maple isn’t the only plant that encourages bees while also having a back-up plan. In addition to their charming, well-known blossoms, violets—another early spring bloomer—produce small closed flowers underground. The drab, white flowers never even try to attract a pollinator. They just self-pollinate and produce fruits that release their seeds directly into the soil. It’s an efficient system, with no resources wasted trying to attract finicky insects. But self-pollination doesn’t allow for genetic exchange, which would strengthen diversity in the gene pool. Some plants put such a high value on genetic exchange that they always require cross–pollination (pollen from another plant of the same species) in order to successfully set seed. Apples, blueberries, melons, cucumbers, and squash are just a few examples. Worldwide, bees pollinate about one-third of all food crops, and an even higher percentage of native plants. Even when a species of plant has a back-up plan (like maples and violets), research has shown that plants pollinated by bees are healthier, more diverse, and produce more seeds. Plus, as flowers have evolved to appeal to different types of bees and pollinators, their colors, shapes, scents, and diversity have become attractive to humans, too. Pollinators support plant communities, which ensure a healthy and adequate supply of food and shelter in our ecosystems. Plants pollinated by bees provide fruits, seeds, and vegetation at the base of the food web, and their energy is carried up the food chain as carnivores eat herbivores. Those plants also provide shelter and habitat for pretty much everything. Bears eat many bee-pollinated fruits, but probably would prefer to eat protein-rich bee larvae instead of honey. Many birds eat fruit, but they also eat and insects (including the bees themselves) that feed on the bee-pollinated plants. And birds build their nests in trees and shrubs using materials from plants. Deer munch on your flower garden, and wolves munch on deer. Even a mighty silver maple tree benefits from the work of tiny bees. So it worries me that more than half of native bee species are declining, and nearly one in four species are at increasing risk of extinction. Our industrial agricultural practices are partly to blame, but habitat destruction and pesticide use are problems on many scales. The solutions are also applicable on many scales, including that of your own backyard. You can provide habitat by planting native flowers that will bloom throughout the spring, summer, and fall. But be wary of cultivars, because they often lack the specific cues or abundant nectar to attract bees. As you tend your yard, avoid using pesticides whenever possible. 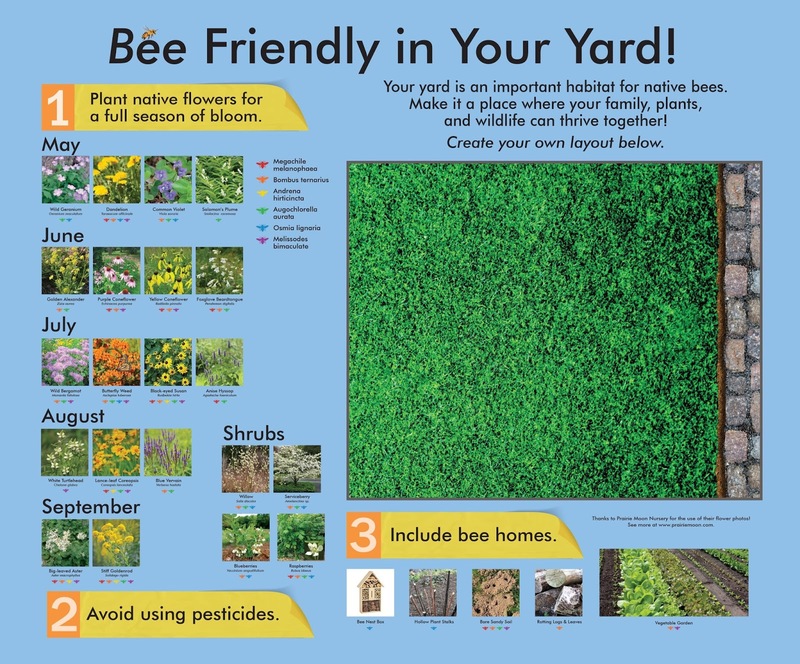 Leaving parts of your yard “messy” will provide bees with bare soil, rotting logs, fallen leaves, dried plant stems, and other important components of their habitat for nesting and overwintering. For 50 years, the Cable Natural History Museum has served to connect you to the Northwoods. Come visit us in Cable, WI! Our new exhibit: “Bee Amazed!” opened on May 1, 2018.